IKEA have a pretty good selection of facades. 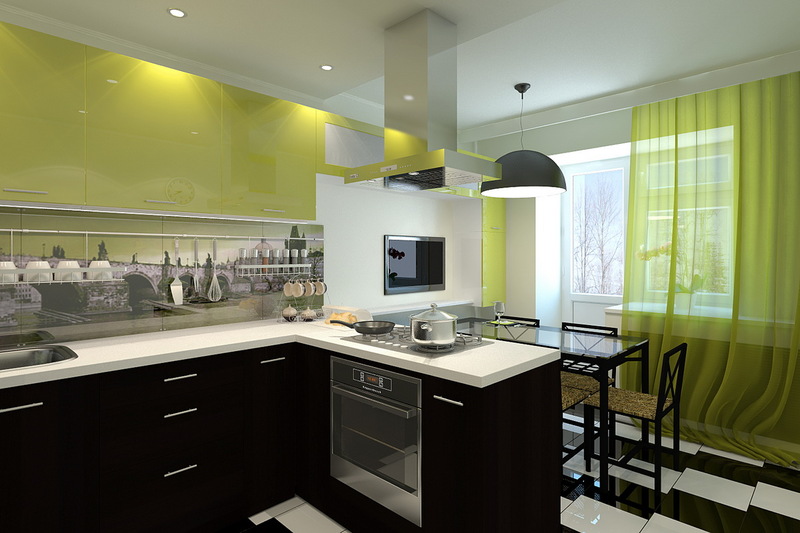 We believe that with proper approach, each of us, even the most demanding consumers can pick up a kitchen furniture. Here we will focus on a series of front panels and doors, as well as a series of separate kitchens and try to give them adequate and objective description. ABSTRACT Is a wear-resistant and easy-care kitchen. 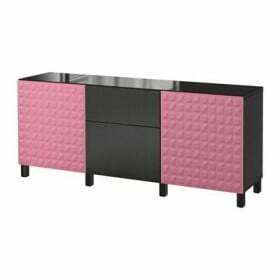 The series consists of front panels and doors for floor, hinged or corner cabinets. This kitchen can rightfully be called "brilliant" in the literal and figurative sense of the word. Glossy doors give ABSTRACT a special twist, thanks to which it does not look like any other series. The doors of the lockers are made of fiberboard. We recommend special attention to red facades, they are covered with acrylic plastic, while the remaining colors have a film coating. The manufacturer also offers this series in glossy cream, gray, black and classic white. 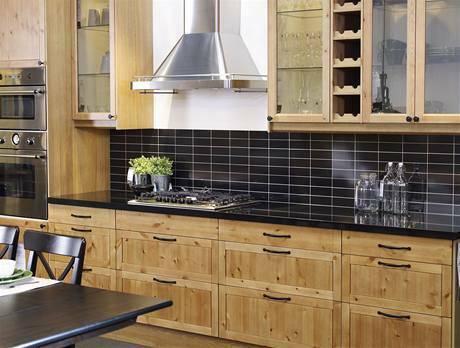 Another advantage of ABSTRACT kitchen is the possibility of combining it with elements from other IKEA kitchens, for example, the doors of RUBRIC. Glossy same performance makes them not only strong and wear-resistant, but also very attractive, which can not help pushing the choice of products from the ABSTRACT series. Dreaming about the place of comfort, who recalled the good old Europe with her family values? 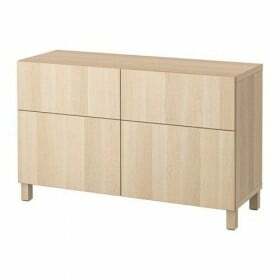 Recommend to pay attention to the line LIDINGÖ From IKEA. Judging by the reviews, the impressions of buyers about LIDINGO are quite contradictory. 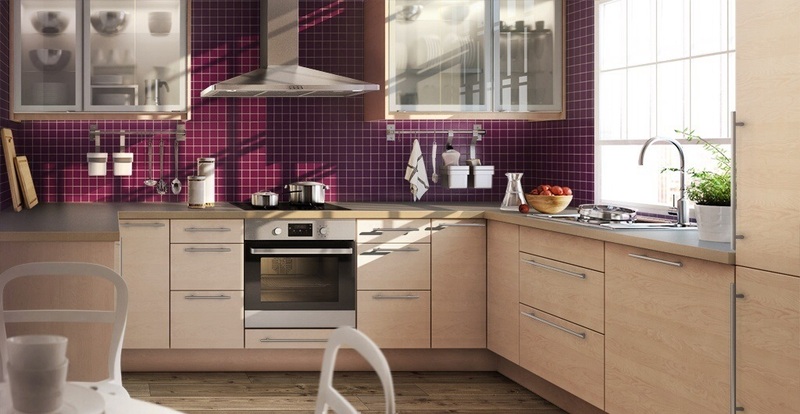 Some of them consider the kitchen of the LIDINGO series not practical enough, given the snow-white color of its facades. And its cost is slightly higher than the standard prices for IKEA kitchens, but the aesthetic appearance and restraint of LIDINGO can not leave consumers indifferent and this more than compensates for the cost of this beautiful and high-quality furniture for the kitchen. Compactness is another advantage of LIDINGO, and the facades are surprisingly resistant to pollution. The secret is that they are covered with a melamine high-pressure film that is not afraid of dirt or fat. 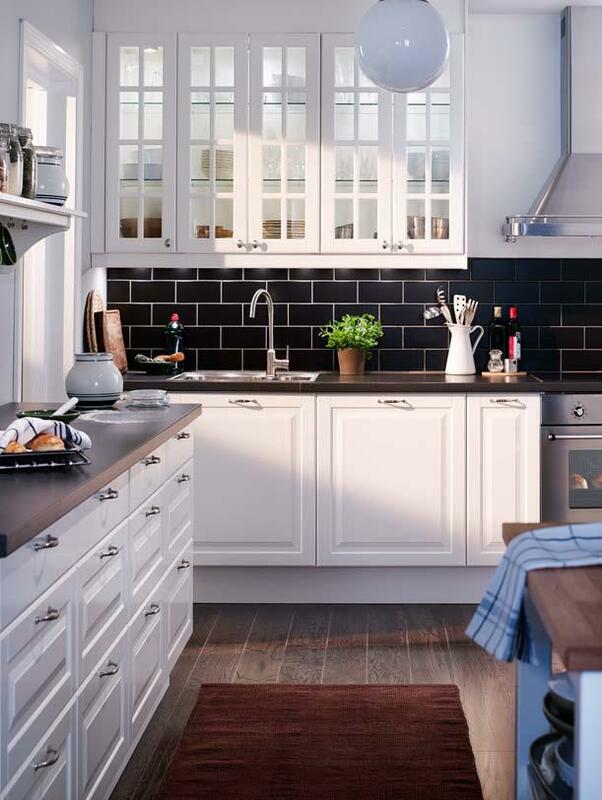 In the IKEA catalog there are various options for decorating the kitchen in the style of LIDINGO: blind wood (including dishwasher) and glass doors, front and decoration panels. 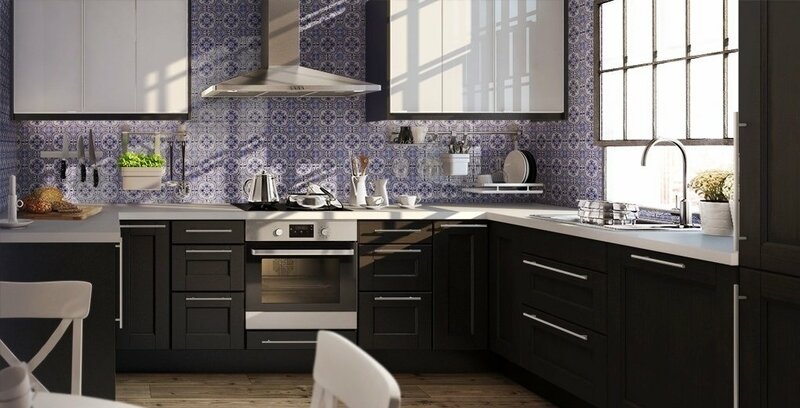 Kitchen in the style of "Provence" has recently become widespread and popular. Needless to say that such dishes like no one other style "Provence" fascinates with its elegance and romanticism. A significant role in the style of "Provence" plays the furniture color. It is dominated by bright colors and shades: white, milk, beige. 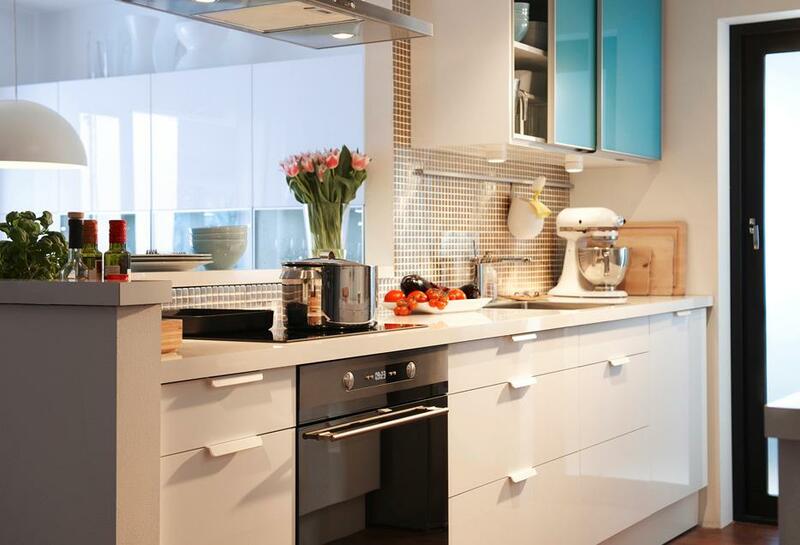 Lightness and airiness of a visual kitchen help accessorize collections of IKEA, as well as flowers and plants. In the presence of a series of CTOT IKEA has had front panels, doors and hinged for corner cabinets, doors with glass facades and even for horizontal placement. Complete with a series of frames, wardrobes CTOT fact. Democratic variant of the kitchen is a series of fronts APLOD. Some even call it futuristic. Futuristic style - a rejection of something familiar to us, immersing in an unearthly and energy. On the other hand, APLOD to some extent and may appeal to owners who love the classics. Moreover, the combination of red and white lovers contrast. If you like to spend a lot of time in the kitchen, then APLOD created for you. This series of fronts can also pick up appliances, performed in a strict and minimalist style. Series facades APLOD combined series of goods of headings and fact. Серия GNOSHЁ Is a front panel, doors and overlaid panels, executed in black, under a tree. 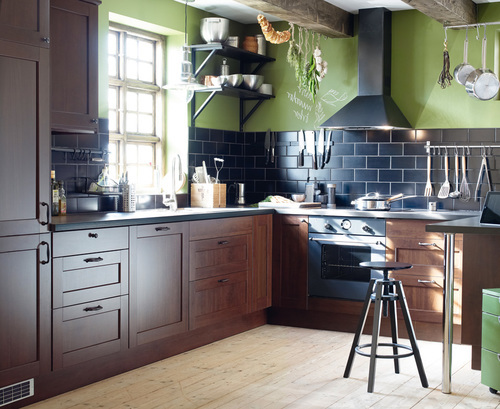 It is believed that dark colors and shades are relevant only for a large area of ​​the kitchen. Since the dark color narrows and reduces the room, albeit visually. But Gnosho is exactly the borderline version that the designers of IKEA have found. Visually, space does not decrease in any way. An important quality - moisture resistance - is achieved in the GNOME by combining the chipboard with melamine film and polypropylene. From this material, doors and front panels of the series are made. Actually, apparently, therefore, the guarantee for GNOSHE is as much as 25 years. In general, this series can be called majestic and in a design-serious manner. NEXUS - a series, in fact, not very well-known in wide circles. 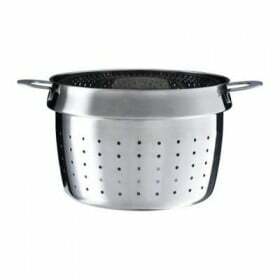 This is a fairly inexpensive series, which is suitable for a detached house or for those who spend most of their time away from home and use the kitchen as needed, but rarely. Let's explain why: the facades are made of chipboard, birch veneer and covered with a transparent varnish with a shade. With intensive use and constant presence of moisture, they quickly deteriorate, having lost their original appearance. The series is represented by doors and front panels in one color, which, it seems to us, is another, albeit insignificant, but a minus of the series. So, NEXUS - a good price and quality series, but with certain reservations in operation. The first thing that comes to mind when you see a series of NORE Is the word "comfort". Really nice looking, aesthetic, visually serene series. This is facilitated by variations in the surface structure of facades. And another series looks rich, seriously, due to the fact that it is made of solid wood and veneer of oak, covered with acrylic lacquer. Oak has long been considered the most reliable material, so there is no need to worry about possible disadvantages in its use in the kitchen. Pleased with the presence of facades with glass, they always give the kitchen a twist and a more interesting appearance. 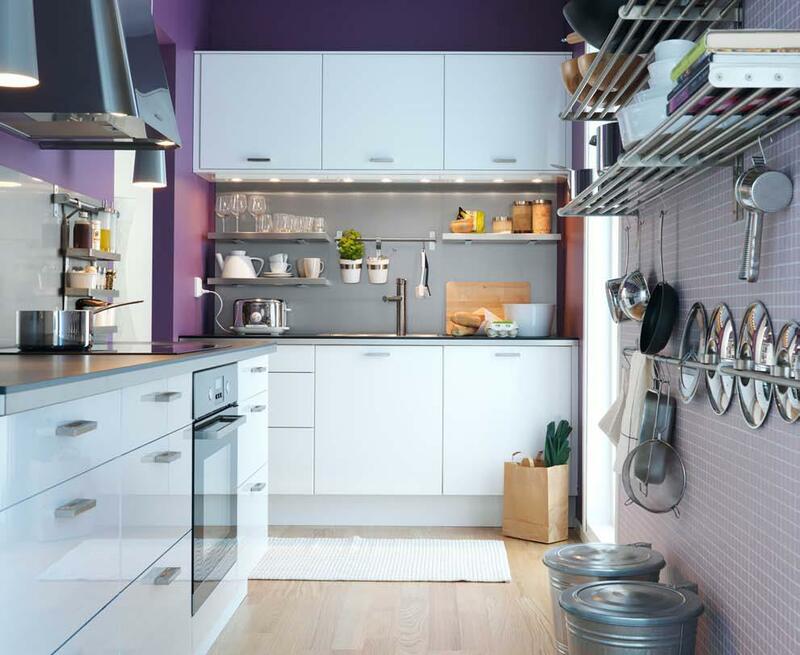 IKEA designers also came up with a "gift" for the housewives: removable shelves, which can be easily cleaned and fixed if it is necessary to place more utensils or items of kitchen utensils. 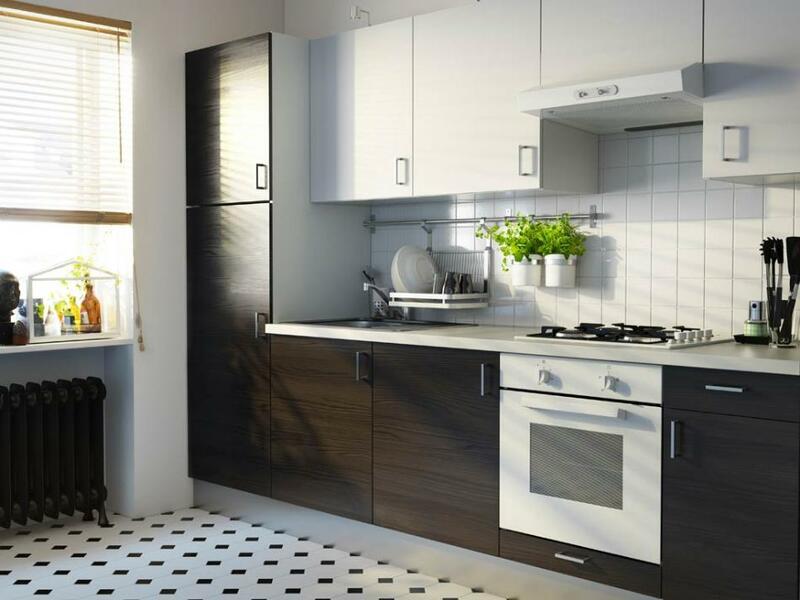 Judging by the title of the series, it should be at least convoluted, but IKEA designers decided to surprise customers by developing a series of very simple facade in white and black and brown. Despite the apparent reliability of facades, exploit them should be carefully, avoiding long stay wet. RamsjöAs NEXUS made from birch wood. The only difference is the use of veneer not like the Nexus, and birch. Compared with oak is undeniably more vulnerable material. Complete with a series of front panels Ramsjö widely used frameworks FAKTUM series. Also in the catalog, there are several options for overhead panels mounted and floor cabinets PERFECT Ramsjö. ROKKHAMMAR - kitchen in the style of "universal"
Kitchen ROKKHAMMAR Is rightly recognized as a universal solution for a kitchen of any size. This line of furniture is successfully used both in cottages, and in urban flats and houses outside the city. The furniture of the ROKKHAMMAR series is made of the finest materials, and the lamination of the countertops prevents them from mechanical damage. Convenient drawers help hostesses to organize the storage of many trifles necessary in everyday life. For fans of island kitchens designers ROCKMAGMAR have developed a kitchen "island". 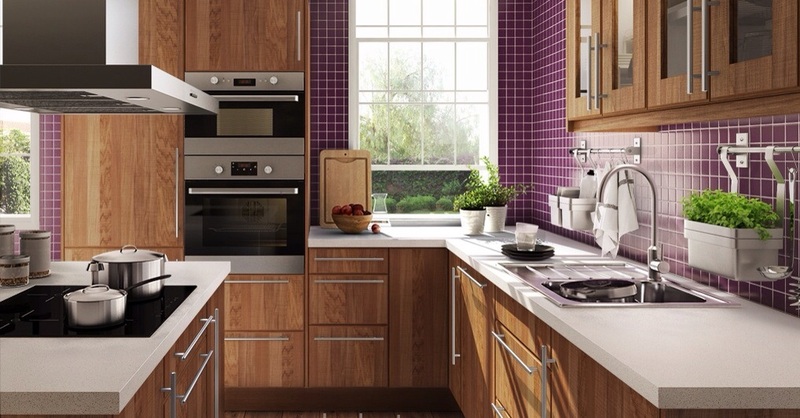 The kitchen of the ROCKHAMMAR series is for those who prefer style, neat appearance and respectability. She is quite capable of serving her mistress for many years, even taking into account active exploitation. A large list of cabinets of various configurations - floor, corner, hinged, high - allow you to create the kitchen of your dreams. The presence of removable shelves, metal baskets and drawers is an excellent way to achieve the desired result. RUBRIK - really bold series of kitchen facades of IKEA. It includes doors for cabinets and a dishwasher, as well as finishing and patch panels. There is a series of RUBRIC and a glass door. This collection, in our opinion, looks very modern, bright and bold, in particular due to the color spectrum provided by the manufacturer. Here you can see the green gloss, and blue, and red, and even the color - light turquoise. Also, the exterior of the facade can be made of stainless steel, which is very fine for the kitchen in a modern style, high-tech style. 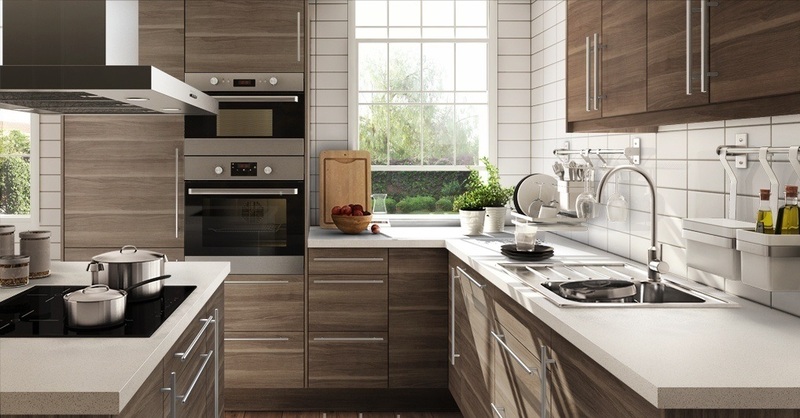 This will relieve the owners of additional solutions and searches for kitchen appliances to match the facades, because there are so many of them in the color of "stainless steel" that, of course, will simplify and speed up the design of the new kitchen. Absolutely "smooth and quiet" series of fronts - SOFILUND. Consists of all possible options for doors and panels in various sizes. Front color pretty good - a walnut, light gray. No frills, pleasant to read, although it may, in the opinion of some, and rustic in appearance collection. Pay attention to the fact that the collection contains items such as base and decorative cornice, which can be a significant factor in the selection. Complete with a series of classical facades SOFILUND - using FAKTUM cabinets. FAGERLAND - a series of fronts "with a twist"
Not ignored us and such an interesting series in all senses of the facades FAGERLAND. What is its peculiarity? First of all, leafing through the catalog, the presence in the collection of FAGERLAND goods of such an element as a wine cabinet is evident. 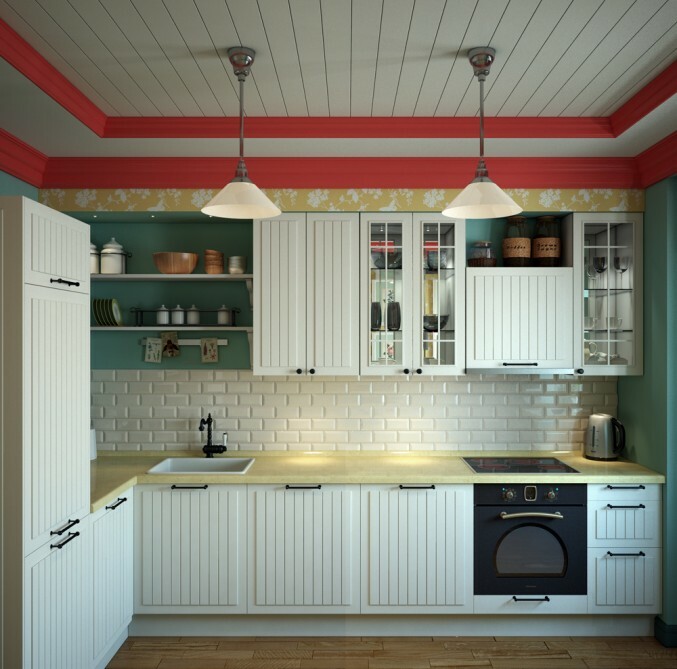 This is great can help to give the kitchen a non-trivial appearance and dilute a number of facades. And now back to the topic of facades: the choice here is sufficient, there are overhead and frontal panels of cabinets (as a cabinet manufacturer, again, recommends FAKTUM), a glass door, socle, doors of hanging cabinets, including for placing a microwave oven. Another factor that attracts the buyer is the color of the facades of FAGERLAND: an array of pine covered with stain, in the style of antique. Series facades with melodious name really is quite "comely" collection. Accurate performance in birch veneer, stained and coated with a clear acrylic lacquer, ensures ecological material facades. Door frames are made of solid birch. Door panels can be installed on the right and on the left side. The entire series is executed in one color - classic brown. 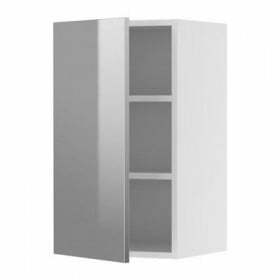 In stock have all the necessary facades for kitchen design, in particular cabinets FAKTUM series. Pleased and warranty, which states IKEA Edel, - 25 years!